Got a masters degree in chemistry at the University of Nijmegen, and is doing his PhD research on molecular representation at the same University. Plays basketball and programs Java applications. 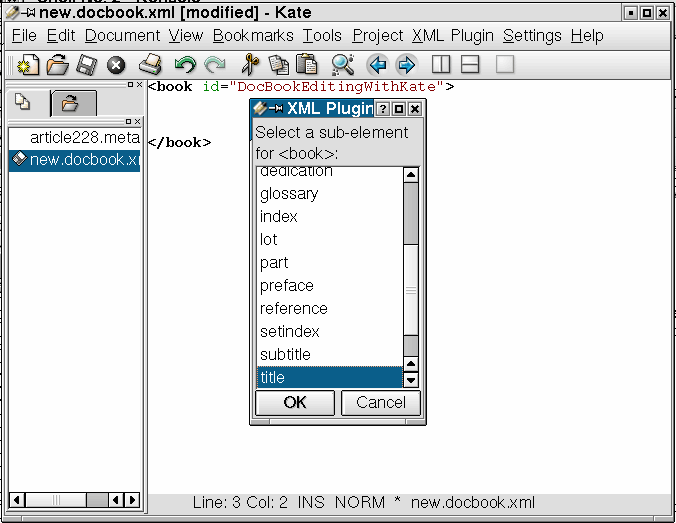 This article describes the use of Kate and its XML plugin as a tool for editing DocBook XML documents. OpenSource XML editing has been long an issue. People need an editor that can produce valid XML, and preferably see the output directly. There are editors that can do this, but they are proprietary. In the OpenSource world there are a few programs that do not give you a nice graphical preview, but that can produce valid XML documents and that can advise you on the elements that are allowed at a specific position in the document. There is of course Emacs with its DocBook minor mode which works fine (see previous DocBook article). This special mode makes it possible to choose child elements to be placed in the document based on the elements already in the document. And, that allows tab completion based on this knowledge. But in this article I will not discuss this, but will introduce Kate as a Docbook XML editor instead. Meta DTDs are generated with Norman Walsh's dtdparser, of which packages can be downloaded from SourceForge.net. The resulting docbook-xml-4.1.2.dtd.xml can then be copied to /path/to/kde3/share/apps/katexmltools/ where /path/to is changed to the path where KDE3 is actually installed. But your homedir will do too, as the XML plugin will ask for a filename when assigning a new Meta DTD (see below). In the new, empty document we type "<book>". To close the element we type F11. If syntax highlighting is not turned on yet, you can do this manually by selecting "Highlight Mode" in the "Document" menu. XML syntax highlighting is in the "Markup" submenu. Placing the cursor between the "'s and pressing Ctrl+Return even gives you the possible values for the attribute if they are defined in the DTD. This is not the case for the id attribute. One downside of this plugin is that it is only aware of child elements, and not about the order or times is is allowed to occur. For example, the DTD does not allow two or more title elements, but the XML plugin does not warn you about this. Since the plugin also does not have a validate option (yet), it is still very easy to get invalid documents. The KDE project itself also uses DocBook as a format for their documentation. As such the XML plugin comes by default with a KDE customized version of DocBook. Assigning that Meta DTD for DocBook is of course preferred over the Meta DTD for DocBook XML 4.1.2 if writing KDE documentation. DocBook nowadays also supports MathML for including mathematical equations in documents. A mixed DTD for validating DocBook documents with MathML code can be found in this email message. SVG's DTD has unfortunately not been written in such a way that it is possible to include it in DocBook. But efforts to make this possible are undergoing. Use in Kate's XML plugin requires making a new Meta DTD based on the combined DTD with dtdparse. 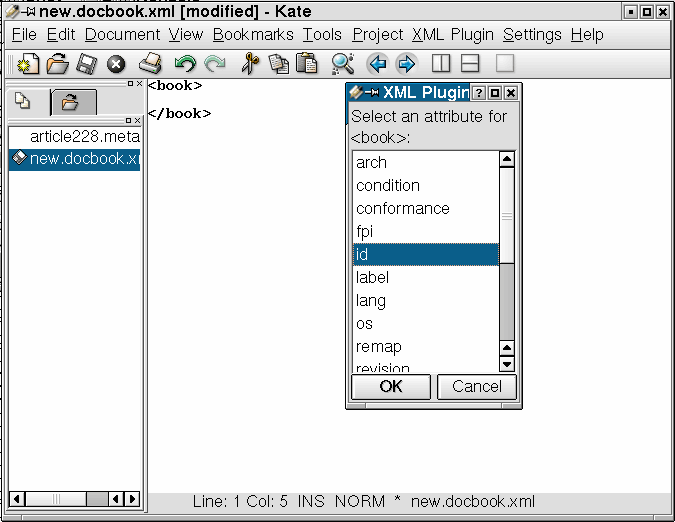 The XML plugin for Kate can help you a lot when editing DocBook XML documents. It is not perfect, but then again, it was developed only recently. With KDE 3.0 it is available for very many people.